On my recent holiday, it almost seemed that jewellery was following me around the Mediterranean – not that I was complaining about it! Possibly the pinnacle of this trend was the day we arrived in Mykonos to find the Archaeological Museum we were planning to visit anyway (first pottery depiction of the Trojan Horse, anyone?) turned out to be almost completely filled with an exhibition on Cycladic jewellery from prehistory to the present day. The exhibition, titled ‘Vanity’, was laid out in chronological order spanning a very impressive 7 millennia. It was also, as the exhibition leaflet proudly proclaimed, a ‘meta-exhibition’, with the museum itself becoming a giant jewellery box. It all sounded pretty good to me, and that was before we even saw the exhibits. I won’t cover everything we saw because there were hundreds of pieces, but here are a few highlights. The Late Bronze Age gave us this absolutely gorgeous necklace made of gold and white glass beads in the shape of lotus flowers. Interestingly, these beads were made in a mould, hinting at a growing market for and mass production of such items. In fact, the display called these shapes ‘standardised’ – the Cyclades were definitely modernising! A couple of centuries later, the Hellenic world had completely changed Cycladic jewellery, bringing exquisitely detailed pieces made from gold, pearls, and semi-precious stones. In fact, jewellery got so ornate that Pliny and Seneca complained about the amount being spent on it… Many of the pieces in the exhibition were from Delos, only found because the residents were forced to flee from the pirates of Athenodorus at the end of the 1st century BCE, and hid some of their gems before they left. Sadly for The Goblin and I, the Cycladic Middle Ages weren’t enormously well-represented, because of the limited excavation activity around this period; understandable given the amount of ancient history there is to explore in this part of the world. This section of the exhibition was dedicated to creations commissioned for the exhibition from 12 contemporary Greek jewellers: Elena Syraka, Ileana Makri, Ioanna Souflia, Deux Hommes, Lito, Minas, Nikos Koulis, Sofia Vamiali, Sophia Kokosalaki, Two Is Company, Venyx by Eugenie Niarchos, Yannis Sergakis. 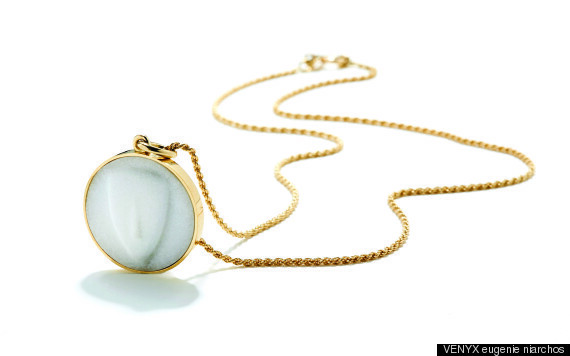 Venyx by Eugenie Niarchos undoubtedly crafted my favourite piece: a pendant featuring a traditional Cycladic head in a modern, gold setting. As well as being completely beautiful, this necklace seemed to epitomise the exhibition as a whole: ancient and modern Cycladic art and creation brought together in one place and one time. Every item in the collection (according to the leaflet) was chosen to highlight that most timeless human trait: vanity. The desire to bedazzle ourselves has been around as long as we’ve known how to thread rocks onto a piece of thread. But it also speaks to the endless creative potential and endeavour of humanity; not only do we want to sparkle, we’re willing to invent and graft to do so. It might seem shallow, but the face (or ear, or wrist) you present to the world can matter, and adornment is a big part of that.